Portable generators can save lives in the event of a power outage. Whether it allows your electric furnace to continue to produce heat, your refrigerator to protect your perishable goods or charging your cell phone so that you can contact emergency services, there are great reasons for considering a portable generator as part of your home emergency plan. However, any homeowner planning to purchase one should learn the basics of portable generator safety. Before you even begin to research generator safety ratings and customer reviews, you need to plan ahead. Make a list of the appliances and electrical devices you intend to use during an emergency. Some suggestions include heat sources, electric water heaters, refrigerators and lights. Read the labels and user’s manuals for all the electrical devices you have on your list to determine how much energy (wattage or voltage) each requires. Add these requirements together to get the total amount of power you will need during an outage. Portable generators are rated based on the amount of power they can generate. Use your total from above to narrow down your search by only considering models that can handle the bandwidth of power you intend to use. Ensuring that your generator can handle the output of required power is the first step to portable generator safety. 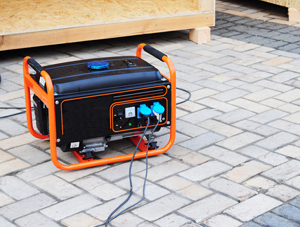 After buying a portable generator, the next important step is to determine where you will store and use the generator. Never use a generator inside your house or any enclosed area, including garages. In addition, do not place the generator near windows, doors or ventilation to your home. Portable generators create carbon monoxide (CO), which can quickly build up in your home and be fatal. While you never want to use your generator in an enclosed area, you will want to ensure that it stays dry during use. Invest in a tarp or canopy to protect it from wet weather and yourself from electrocution. While you are purchasing a tarp, be sure to also buy an outdoor extension cord that is long enough to go from your indoor appliances to your generator, and is rated for the amount of power you need. When the time comes that you need to use your portable generator, always plug your appliances and electrical devices directly into the generator or extension cord. Never backfeed or plug the generator into your home outlets. If you wish to have an automatic backup generator, you will need to purchase a different type of generator and have it installed by a licensed professional. When feeding the extension cord, be careful not to leave it coiled or knotted, as this can cause the cord to build up heat and possibly cause a fire. When fueling your generator, be sure that it has been turned off and has been allowed time to cool down before adding more gas. Always store fuel outside of the home and away from the generator. If you have experienced electrocution or burns due to someone else’s negligence, contact KBG Injury Law. We will fight to get you the Results You Deserve®.